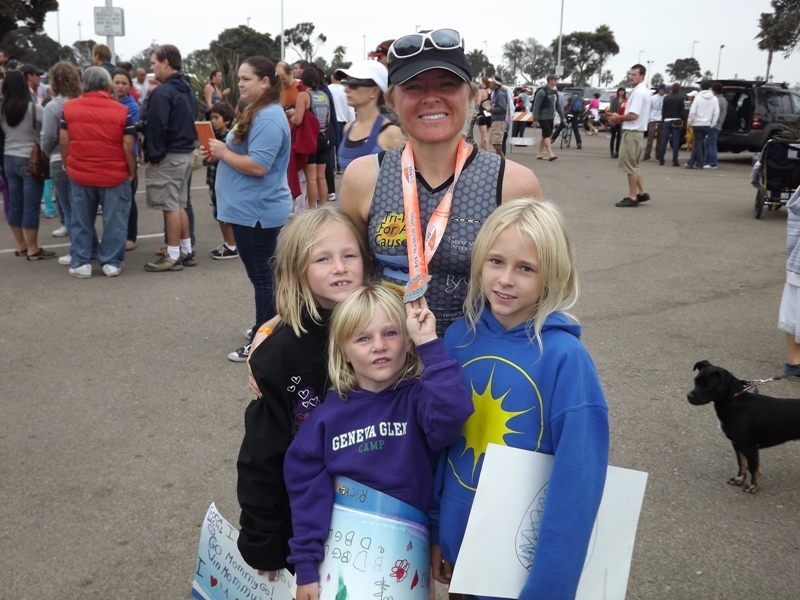 Recovering Working Mom: You know you're a Tri Diva if . . .
Today was my last Triathlon of the season and I went out on a great high note. 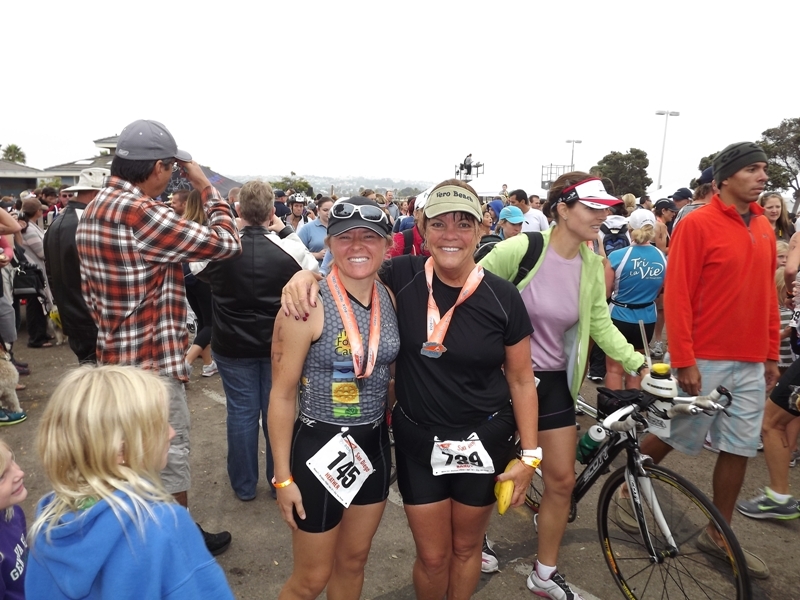 I finished in 1 hour 27 minutes – I swam without a swim buddy for the first time and had my fastest bike and run times yet. Now, 6 hours later, my body is screaming cuss words at me. As I was waiting in the transition area at 4:45am this morning I began noticing a few things about triathlons that were cracking me up, so I decided to share them with you too. 1) At the Pre-race expo the day before the race you purchase a jacket on closeout. It’s not until you get home to put on your new hot jacket that you realize one of the pockets is sewed shut. Love my jacket! Very annoyed with Tri Diva that they sewed the jacket pocket shut. Guess only one hand gets to keep warm. Not great picture of Diva Jacket, but you can see how low the stitching is. D@mnit! ﻿2) You wake your entire family at 3:30am and “husband from heaven” schleps your three girls around the course to see you compete. I was the first person in the transition area and got a fantastic spot! Thank you honey! Oh, but here’s a bad mommy moment. It wasn’t until we got to breakfast that I felt the Ego’s (middle child) forehead and realized she had a fever, sore throat and earache. She was in bed the entire rest of the day. Bad, bad mommy! 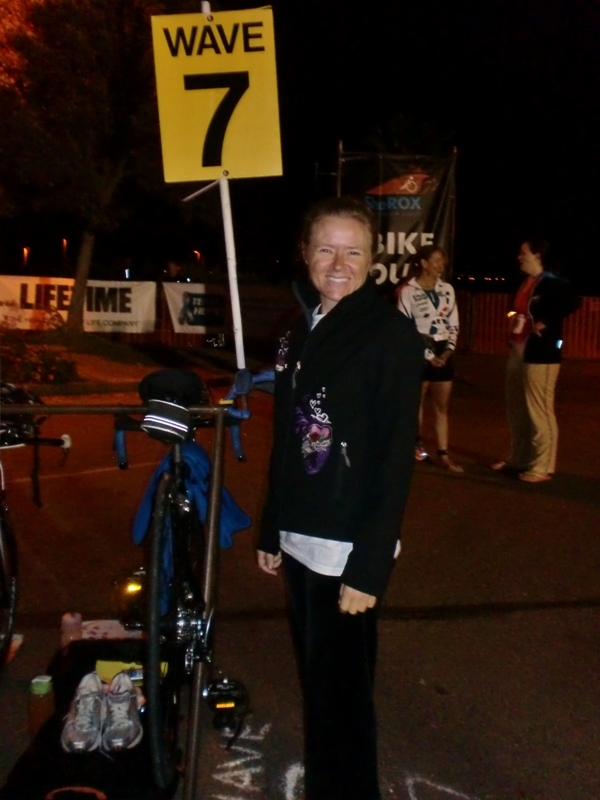 3) You wear a headlamp into the transition area because the blinding spotlights that they provide are not sufficient for you. I thought about not calling her out, but this was just too good. Lets just say her name begins with a Veronica and ends with a Doud. 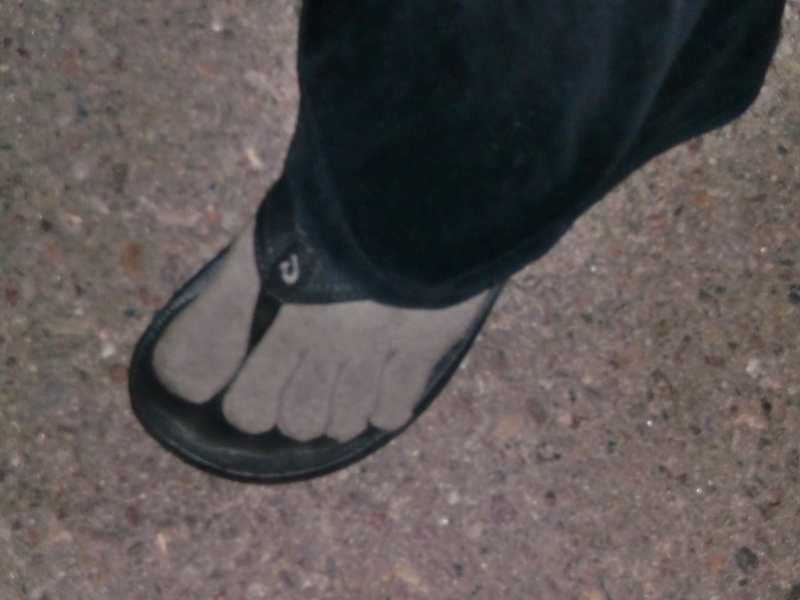 4) You wear Injinji socks to keep your feet warm and one of your friends who sees you says “do you like your Jumanji socks?” I almost pee’d my pants when I saw these things and at the same time, was very creeped out! 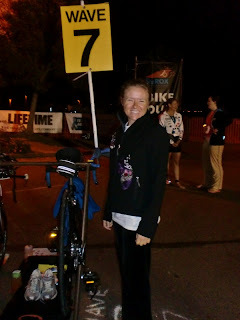 5) You have to pee 3 times BEFORE the transition area closes at 6:45am. Oh, and just to make your life harder, your monthly friend came three days earlier and going in the ocean is the first thing on your list of “must dos” for the day. 6) Instead of a backpack you bring a Home Depot bucket to hold all your crap after you’re finished. This one was ingenious. While all the rest of us are putting our crap in a backpack and then have to clean out the backpack, one woman had a huge bucket that she could just shove all her dirty items into as she came back into transition. I’m doin’ that next time. That and the headlamp and Jumanji socks! 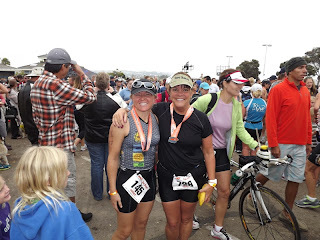 7) You are on the course with one of your teammates and in the middle of the run she turns to the woman next to her and says “oh my gosh, that is so cute . . . is that a top or skirt? 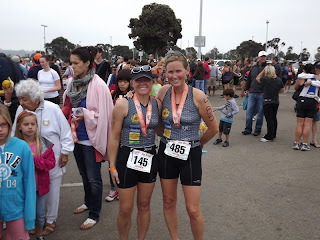 !” Only at an all female triathlon would you hear the women complimenting one another out on the course. For this one I have to give a shout out to Wynne Love. You are awesome Wynne! Always there with a compliment and a smile. 8) You are almost to the finish line, and out of nowhere one of your teammates who you have been ahead of the entire run catches up to you and you cross the finish line together. It’s of course not until 10 minutes later that you realize she was actually in the wave AFTER you and therefore her time is 3 minutes better than yours. D@mnit Megan! 9) And finally, you are prouder of your friends for their accomplishments than you are of yourself. 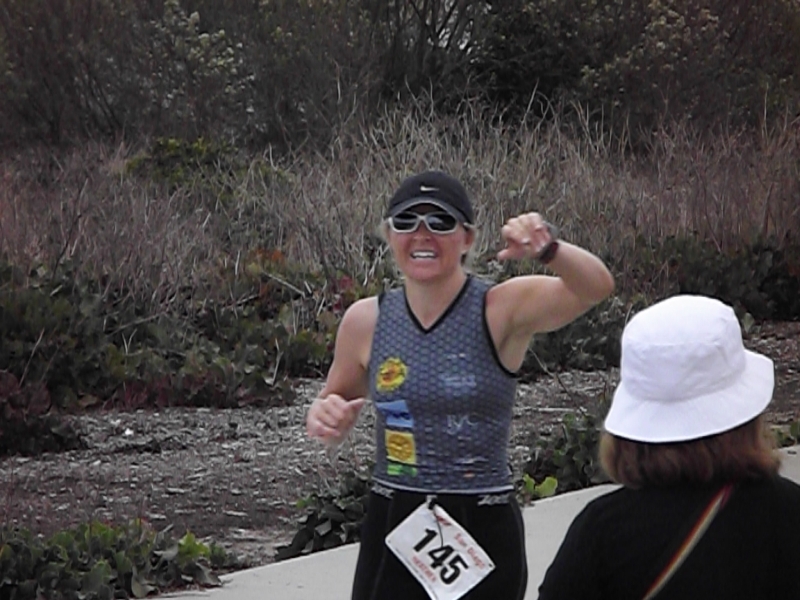 Huge shout out to Nancy Flanagan for finishing her first triathlon. I’m so proud of you my friend. Recommendation for today . . . Find something you don’t think you can do and try it. You CAN do anything you set your mind to, and may find you really enjoy it. 10 months ago I would have accused anyone of smoking crack if they even mentioned that I’d be swimming a ½ mile in the ocean. Now, I can do it in 18 minutes and feel an incredible sense of accomplishment. Also find someone to do it with you. I have made some of the most incredible friends on this journey! Until next season, it’s back to bein’ just momma instead of Tri momma. Although, now that I think of it, I’m always Tri momma because of my trifecta! My three little lovies! They made the cutest signs to support me.